WASHINGTON, USA (AFP) — More than 100 people remained unaccounted for Monday after a devastating landslide in the US state of Washington killed at least eight and sounded “like a small earthquake,” witnesses said. 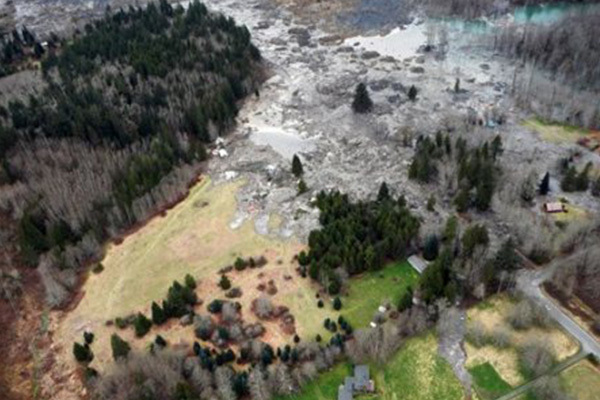 The number rose dramatically from 18 to 108 after the massive landslide slammed into a mountainside town in Snohomish County north of Seattle on Saturday. Emergency management chief John Pennington stressed that 108 is the number of reported missing or unaccounted for, not necessarily actually missing after the disaster on Saturday. But he said there were a total of 49 dwellings of various types in the area hit by the devastating landslide, and that there were likely to have been more people at home on a Saturday than during the week. The wall of mud, rocks and trees smashed into the rural town of Oso, northeast of Seattle in the northwestern US state, destroying houses and part of a highway. Some 100 emergency workers were searching for survivors in the field of mud and rubble about 2.4 kilometres (1.5 miles) across and some four to six metres (13-20 feet) deep in areas.